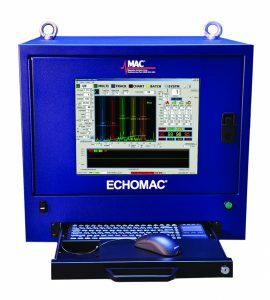 Echomac® Weld Line Ultrasonic Test System. 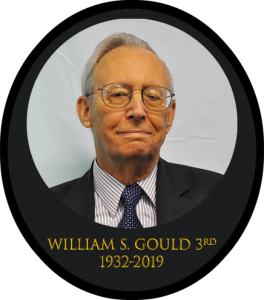 Inspects tube weld quality during production. Weldline Tester with the Test Head conducting on-line production testing of a tube. A separate calibration tube is shown in the off-line position in the foreground. 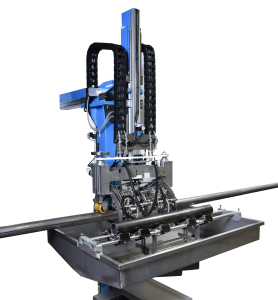 Featuring new operating conveniences for inspecting tube weld zones on-line during continuous production, the system is designed to test for longitudinally oriented defects that are typical of the ERW welding process. These systems typically include four channels, using both CW and CCW sound modes for detection of ID and OD longitudinal defects between 5% and 10% of wall thickness. Additional channels can be added, depending on the application. Includes MAC’s highly regarded Echomac® instrumentation with Echohunter® software. Test head incorporates transducer assemblies, with irrigated shoes, to provide constant coupling with the tube being tested. 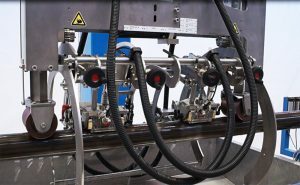 Test head is supported by a pillar mechanism that allows it to operate on the weld line for mill testing, or off line for easy calibration for a new tube size. Operator can verify that transducers are correctly positioned by observing a monitor which shows a laser beam that must bisect the weld center. Convenient joy stick control allows transducer assemblies to be rotated to follow the weld, achieving continuous optimal testing over a weld position of 10:00 to 2:00 o’clock. Spray marker downstream, automatically sprays paint onto the actual defect location to enable sorting of the cut tubes. Change out individual transducer shoes for size changes in 5 seconds using quick disconnect mechanism. Other options for testing weld quality are also available from MAC. Our 90+ years’ experience in NDT and trained and experienced MAC people can help you to determine which test method should be used.